Foursquare seems to be in the news a lot recently, and is starting to exhibit a similar hype curve to that of Twitter. Update 15 March 2010: with one tweet from @mrskutcher (aka Demi Moore) the battle of the location based social media platforms is now over. Now that she is on Foursquare and other celebrities (such as @aplusk) are sure to follow, it’s game over for all other platforms. The über adopters and innovators get on first, try it out (as they did at SXSW last year when Foursquare launched) and then tell their friends, build a fan base then the celebrities get on it and the rest they say is history. For those who have been on holiday or off-line for most of 2010, Foursquare is a location based social media service where you can arrive at a location or venue and “check-in” (manually) to tell other people that you are there (or have been there). To those who have just stumbled across Foursquare for the first time, it seems like a great waste of time (remember what we all said about Twitter in 2007…). For those Location Based Services (LBS) purists out there (and I can see you scrunching up your face as you read this post) you will hate Foursquare because the user has to physically hit a “check in” button to tell the system, and their friends that they have arrived. In fact I used to be one of those people. When Brightkite came on board (it uses a similar principle) I was very negative about it. The fact that a multi-billion pound mobile network knows exactly where I am at all times yet I had to manually tell it where I was seemed quite strange to me. However – mix a location service that gives users FULL control over how and when they share their location with a social network on your mobile and you hit pay dirt! The rest of this post explains why the Foursquare model works and why it will be the hit of 2010. To back up just a bit. I think location based services have been misunderstood by mobile operators and consumers alike for a long time. For so long everyone (including me) had been fixated on the automatic and always-on nature of mobile location. Mobile operators during the mid to late part of the 2000’s completely wasted an opportunity to provide reasonably priced location look-ups to 3rd parties, and their location products portfolios have gone nowhere as a result. Google were equally frustrated that they could not purchase location information on reasonable terms from mobile operators, so they constructed the world’s largest database of mobile operator cell-sites and public WiFi networks. This is the reason why when you hit the “locate me” button on your iPhone or are using Google maps on your mobile it locates you to pretty much where you are anywhere in the world. This has spawned a huge range of location based services that use the Google database to instantly locate you and then allow the 3rd party to provide the context to where you are. This is the heart behind Foursquare, as they rely on the Google location service to place you, then leverage their own database of places around you AND critically, allow Foursquare users to add their own places – thus massively expanding the database at almost no additional cost. If I had a £ for each of the people who have contacted me looking for advice on how to launch location based services that then push advertising, then I would not be sitting here blogging in a Starbucks on the weekend. The major cost of a location based advertising model is building out the local database with accurately geocoded information for each venue. With the Foursquare model, the users are actively encouraged to expand, update and edit these locations – at no cost to Foursquare themselves – genius! Indeed mobile social networking is not about pushing more advertisements onto your phone while you are out and about. It’s about connecting you with people and places. 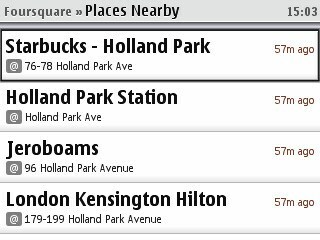 The Foursquare model has a subtle link to advertising by allowing you to see offers at the places you are checked into (or about to check into). This is a very different model to the traditional approach of advertising (reach and frequency) which is “hit as many people with ads as often as you can”. Sadly, with the invention of the new channels of mobile and social networks, the Mad Men (and women) of Soho and Madison Avenue want to apply the same approach. THIS APPROACH WILL FAIL ON MOBILE AND SOCIAL NETWORKS. Try this the next time you are at a conference or party. As you approach a group of people to join the conversation, scream loudly that your company is the best one and you should buy more of the products you sell or your company sells. I bet you don’t do that, but this is an example of what it is like using the traditional advertising model on social networks. Back to location and advertising, I have spent many a location conference debunking the “Starbucks example” where “you’re walking past a Starbucks and you get a message on your mobile with an offer for a free coffee”. My strong view was that this particular mechanic would never take off due to the cost (the cost of locating you just in case you might be near a Starbucks and want a coffee would be more than cost of the coffee). 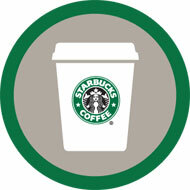 In fact during the week Starbucks in the US actually announced a deal with Foursquare where regular visitors to their stores could unlock the Barista badge, and hence identify themselves as a regular customer and receive a benefit. This adheres to the 3Ps of mobile (and social) advertising and that is Privacy, Preference and Permission. 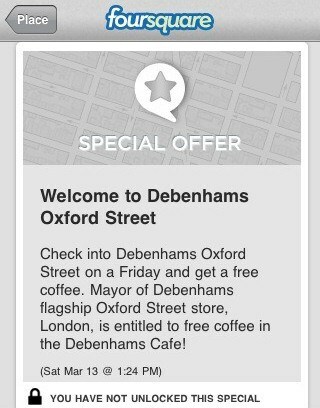 Even in London, Foursquare is showing that offers are available at a particular location – here is one for Debenhams in Oxford Street, London. In the example below, the Mayor (person who visits this location the most frequently) gets a free coffee. Suddenly, Foursquare as become a social currency (and a tangible one when you factor in the price of a coffee in central London). So why has the traditional approach to location failed and why will the Foursquare approach work? I’ll answer that in a follow-up post as this one is already way too long – stay tuned. 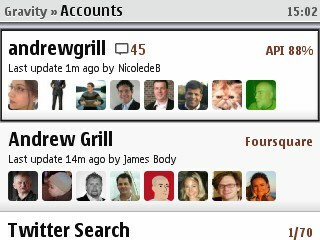 TIP: if you have a Nokia (later model smartphone like an N97 or E72) then you absolutely MUST buy copy of Gravity – a native Symbian app crafted by @janole that allows you access to Twitter AND Foursquare from the same app. It is thanks to Gravity that I started to really use Foursquare on a daily basis because it makes it so easy to check-in and also use twitter. Picked up this post after it was RT’d by @janole (the man behind the Symbian powerhouse social media app Gravity), it was a great read. Its helped me figure out the why question that’s been nagging me about where 4sq fits in the social media and marketing landscapes. Michael – glad I was able to figure out that important question: “Foursquare is cool but what does it mean for advertisers”!